A new CEEO course based on the NSF-funded project - Novel Engineering: An Integrated Approach to Teaching Engineering and Literacy. This is a stand-alone course that is NOT part of the current TEEP certificate program. Novel Engineering allows students to engage in meaningful, integrated engineering and literacy tasks while meeting standards for both disciplines. Novel Engineering is an approach, not a set curriculum, so teachers can implement it in a way that makes the most sense for their individual settings. Although Novel Engineering is a simple concept, implementation is complex because teachers need to consider a multitude of logistical, pedagogical, and discipline-related issues. Teachers play a pivotal role in Novel Engineering units by providing a supportive, responsive environment where K-8 students can build on their ideas as they work on complex problems. We believe that teaching engineering involves listening to, understanding, and responding to student thinking. 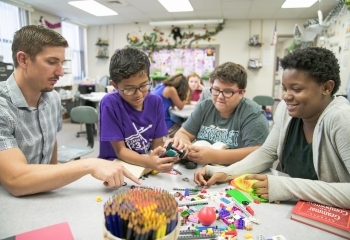 By implementing Novel Engineering in the classroom, K-8 students are given the space to explore their ideas through the design projects they work on in the classroom. The Novel Engineering course is a semester-long (14 week), online course that is asynchronous which means participants can complete work at their own pace, on their own schedule - which is a perfect fit for teachers. Each week assignments will be posted and students will complete the work and upload their work onto the website. Class topics will be a mix of discussions around theory and pedagogy. By the end of the semester, students will have developed and implemented a Novel Engineering unit based on a book of their choice that supports engineering and ELA goals, and helps foster student-centered design and responsive teaching within an integrated activity. Engaging students in engineering by having them work through Novel Engineering activities - This allows participants to experience engineering themselves and reflect on their own understandings of engineering and the engineering design process. Discussion will focus not only on engineering within Novel Engineering, but engineering as a discipline. Looking at video of K-8 students engaged in Novel Engineering activities to understand what NE looks like in a classroom and to identify the beginning of engineering in an integrated activity - The second strand also focuses on developing a disciplinary sense for engineering, but this time in the context of looking for beginnings of engineering in students’ work. Planning Novel Engineering activities for the classroom - Participants will plan their own activities, with explicit focus on anticipating how their own students may respond. Anticipating student responses while planning lessons can focus attention back to the students, and builds in a check to see if the tasks allow for multiple design paths. Topics such as presenting materials to students, student planning, incorporating writing, and supporting students to make functional designs will be included. Related literature - We will read articles related to engineering and literature that help us to unpack. Integrating Engineering and Literacy course will start Fall 2019. For folks interested in the course for professional development points, contact elissa.milto@tufts.edu for more information.